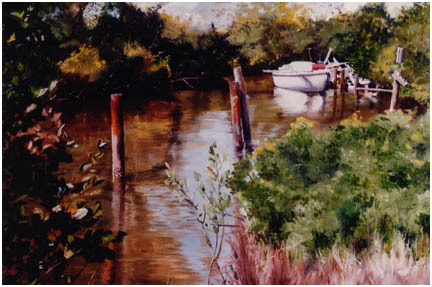 The painting features a small sailboat at anchor in a sheltered cove of the North Fork of the St. Lucie River. The sailboat is almost a background image, overpowered by the lush vegitation in the foreground. The painting emphasises the elements of classical realism. Realism sets as a goal not imitating past artistic achievements but the truthful and accurate depiction of the models that nature and contemporary life offer to the artist.